ARCO regrets to inform its members of the death of Brigadier General John Egan, St. Brigid's Road, Clondalkin, Dublin 22. On December 16th 2013, peacefully in the loving care of the staff of T.L.C. Nursing Home, Maynooth, Co. Kildare. Beloved husband of the late Phyllis, deeply regretted by his loving daughters Gillian & Orlagh, sons-in-law, grandchildren, nephews, nieces, Gary, relatives and friends, Rest In Peace. Reposing at T.L.C. Nursing Home. Removal on Wednesday at 9 o' clock to arrive in the Church of the Immaculate Conception, Clondalkin for 10 o' clock mass, followed by cremation in Newlands Cross Crematorium. Family flowers only please. Donations if desired to Alzheimer's Association of Ireland. Lt. Col. Pat Nugent R.I.P. ARCO regrets to inform its members of the death of Lieutenant Colonel Patrick (Pat) Nugent, on 6 December 2013, of Rathfarnham Dublin 14 and late of Clonmel, Baldonnel and the Gascoigne Nursing Home. Peacefully at St. James’s Hospital, surrounded by his loving family. Sadly missed by his beloved wife Phyl. Treasured dad of Fiona (Neill), Regina (Dunne), Denise (Larkin), sons-in-law Dermot, Jim and Padraic, his adored grandchildren Aisling, Leonie, Ciara, Michelle, Cathal, David and Alison, sister-in-law Rita, nephews, nieces, neighbours and many friends. Funeral on Tuesday, 10 December, after 11.30am Requiem Mass at the Church of the Annunciation, Rathfarnham to Mount Venus Cemetery. 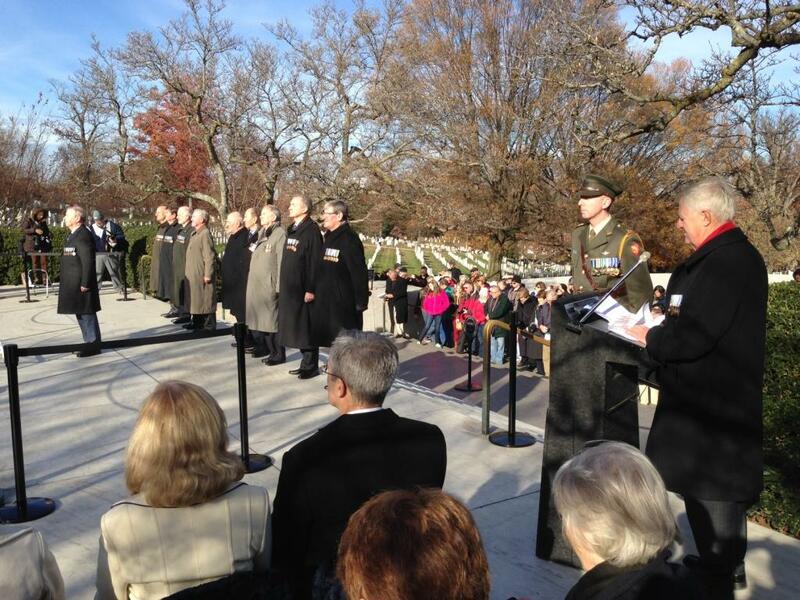 Eleven retired officers (former cadets of the 37th Cadet Class) travelled to Washington on the 23nd November, 2013 to commemorate their presence there in 1963 as a Guard of Honour at President Kennedy’s funeral in Arlington Cemetery. They were accompanied by a colour party of five senior cadets drawn from the current 89th Class under Comdt Frank Flannery and a piper, Sgt Joe Meade. Eight of the retired officer’s wives also travelled. 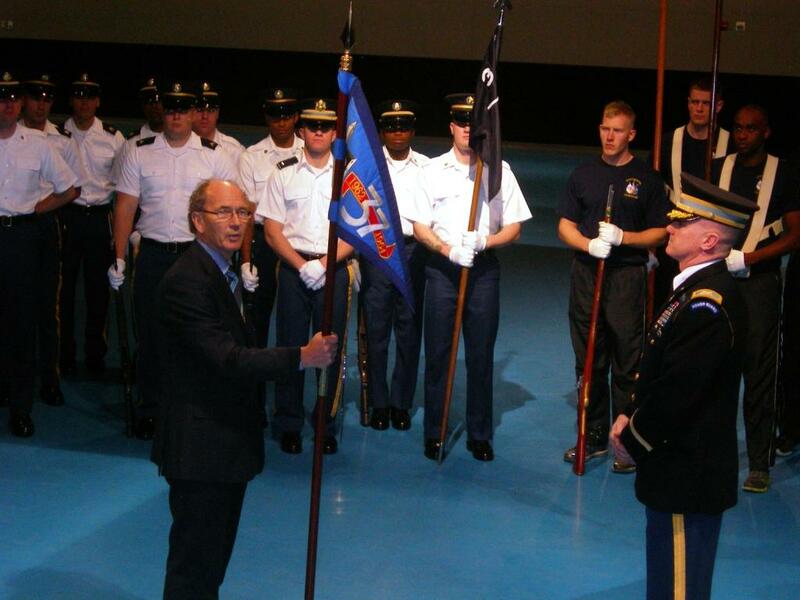 Prior to departure, the US Embassy held a short commemorative ceremony at the Embassy involving present day cadets. 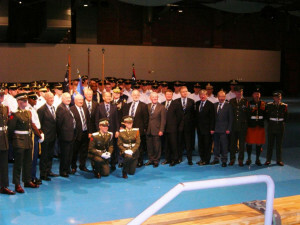 An Tánaiste and the Chief of Staff attended this event. On Monday 25th November the party were received by the Old Guard in Fort Myer, Washington where they had been accommodated as Cadets on the same day and date in 1963. All were delighted to meet US Army Lt Martin Dockery (retd) who had been their Liaison Officer at the time and had flown down from New York for the occasion. After a display of Old Guard ceremonial drill, Lt Col Pete McMahon (retd) presented a replica of the 37th Class Pennant to the Officer Commanding the Old Guard. The main ceremony took place at President Kennedy’s graveside in the afternoon. This ceremony consisted of the national and cadet colours being marched on accompanied by the piper. 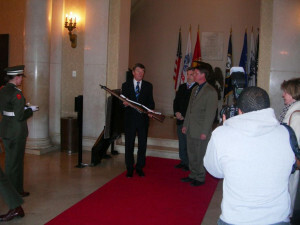 Col Bill Nott (retd) introduced the ceremony and read a poem by W.B. Yeats “The Cloths of Heaven” which was followed by a lament and the laying of a wreath by Lt Col John Dunne (retd) on behalf of the 37th Class and the Defence Forces. The piper brought the ceremony to a conclusion with the playing of “Amazing Grace”, a favourite of President Kennedy’s. The ceremony was conducted in the presence of the Irish Ambassador Anne Anderson and witnessed by many visitors to the graveside. 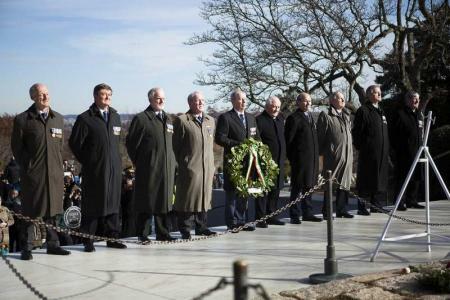 After a short tour of Arlington the party proceeded to the Tomb of the Unknowns where Capt Tom Hickey (retd) laid a wreath on behalf of the Defence Forces. This was a rare honour normally reserved for visiting heads of state and chiefs of staff. In 1963 the cadets had flown to Washington with their Lee Enfield No.4 .303 rifles under their seats. This time Col Eoin Moloney (retd), on behalf of the 37th Class, presented a deactivated Lee Enfield (which had travelled in the hold) to the Arlington Cemetery Authorities as a memento of the historic event, to be displayed in the Arlington Museum. Later that day Ambassador Anderson hosted a reception in the Irish Embassy at which Lt Col Joe Ahern (retd) presented a framed photograph of “Kennedy’s Cadets”, the 37th Class Guard of Honour at the graveside in 1963. The photograph will be hung in the Embassy. The following day the party went to the Pentagon and were given a tour of the building which included visiting the impact site and memorial to the victims of the 9/11 crash. 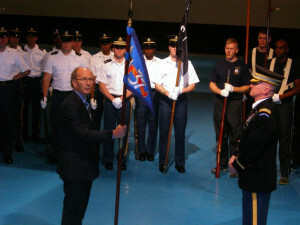 The group were then received for over an hour by General Martin Dempsey, Chairman of the Joint Chiefs of Staff. General Dempsey’s parents came from Mayo and Donegal respectively and Col Brian O’Reilly made a presentation to him of Tyrconnell single malt and a copy Col Tom Hodson’s (retd) Chiefs of Staff Portrait Collection. Gen Dempsey gave each member of the party his dog tag ornamental medallion. In the afternoon the party visited Capitol Hill and were given a very interesting tour of that historic place. As Wednesday was the eve of “Thanksgiving” no formal visits were undertaken and persons were free to visit many of the well known sites and museums of Washington. The main body returned to Ireland the following day while some continued the trip with a visit to New York. All were struck by the warmth of the reception in Washington 50 years after the original event and it was considered that the return visit was a huge success. The group would like to thank all who supported them in this venture including the current and former Chiefs of Staff, the Department of Defence, the Department of Foreign Affairs and the Irish Embassy in Washington, the US Embassy and Military Attaché, McKee Officers’ Club, Mr. W.J. Mc Carter, Buncrana and ARCO.